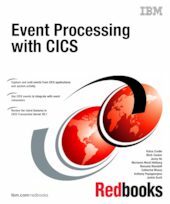 This completely refreshed IBM Redbooks® publication provides a detailed introduction to the latest capabilities for business event processing with IBM® CICS® V5. Events make it possible to identify and react to situations as they occur, and an event-driven approach, where changes are detected as they happen, can enable an application or an Enterprise to respond in a much more timely fashion. CICS event processing support was first introduced in CICS TS V4.1, and this IBM Redbooks® publication now covers all the significant enhancements and extensions which have been made since then. CICS Transaction Server for z/OS provides capabilities for capturing application events, which can give insight into the business activities carried out within CICS applications, and system events, which give insight into changes in state within the CICS system. Application events can be generated from existing applications, without requiring any application changes. Simple tooling allows both application and system events to be defined and deployed into CICS without disruption to the system, and the resulting events can be made available to a variety of event consumers. CICS events can amongst other things be used to drive processing within CICS, to populate dashboards that are provided by IBM Business Monitor and to search for patterns in events using IBM Operational Decision Manager. Part 1 introduces event processing. We explain what it is and why you need it, and discuss how CICS makes it easy to both capture and emit events. Part 2 of the book focuses on the details of event processing with CICS. It gives a step-by-step guide to implementing CICS events, along with the environment used in the examples. Part 3 provides some guidance on governance and troubleshooting for CICS events, and describes how to integrate CICS events with IBM Operational Decision Manager and IBM Business Monitor. The Appendices include additional reference information.